You must have watched countless movies featuring gunfight scenes atop a moving train! As thrilling as these shots might be, have you ever wondered how these bullets would appear to the onlookers standing on the ground? Although most of the bullets are quite faster than the trains, but let us assume that both are moving at the same speed. For a person standing in the front compartment of a train at rest, a bullet shot with a speed of 1000 mph will appear to be traveling at the same speed at which it was shot. The onlookers standing on the ground will also see the bullet moving at a speed of 1000 mph because everyone is standing still. Thus, the relative velocity of the bullet remains the same as its initial velocity. However, what if a bullet is shot by you in the forward direction while you were standing in a train moving in the same direction with a speed of 1000 mph? Would the bullet appear differently to the bystanders? Can you guess what happens if a bullet is shot in the backward direction while the train is moving in the forward direction with a speed of 1000 mph? Since the bullet was shot by you while traveling in the train moving with the same speed as the bullet, the relative velocity between the two is zero. Thus, you will see that the bullet is traveling at 1000 mph. However, the person standing on the ground would see a bullet going twice as fast as the train. For the person standing on the ground, the relative velocity is 1000 mph, while the speed of the bullet relative to the train is 1000 mph. Thus, relative to the person standing still on the ground, the bullet is moving with the double velocity; 2000 mph. 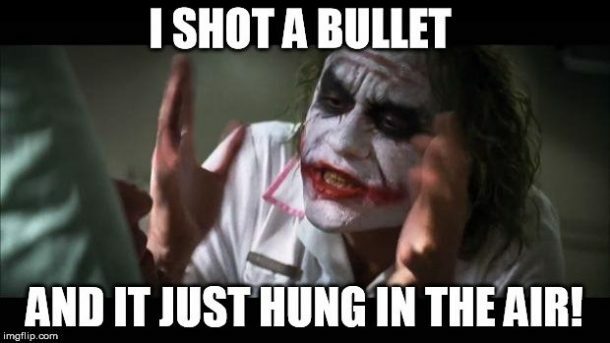 For a bullet fired in the opposite direction, the person standing on the ground will see the bullet hung in the air. This happens because the relative speed of the bullet would become zero as the train and the bullet are traveling in the opposite directions with the same velocity. How many of you got it right? Share this information with your friends and let us know in the comments’ section below.